It's no secret that compact cameras are in decline, with the market logging steady losses year after year. To counter this, we've seen manufacturers try to win photographers back with more advanced features like touchscreens and Wi-Fi that have helped make smartphones the camera of choice. 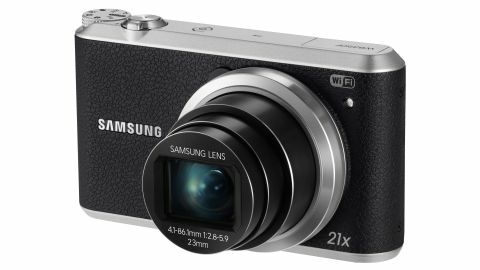 The Samsung WB350F is the manufacturer's latest update to its popular travel zoom digital compact camera. Along with a 16.3-million-pixel, 1/2.3-inch BSI CMOS sensor, the WB350F also incorporates built-in Wi-Fi and NFC connectivity, a 21x optical as well as full manual controls. Other key features include a bright, 3-inch, 460k-dot touchscreen, a shutter speed of 16-1/2000sec, ISO 80-3200, 7.1fps continuous shooting, full HD video recording at 30 frames per second and a host of art filters and special effects. With a price tag of £250, the Samsung WB350F is one of the more affordable options for photographers looking for some of these advanced features. But while the WB350F is certainly impressive on paper, is it merely a jack of all trades and master of none? We put it through its paces to find out. The Samsung WB350F is minimalist, classy and very on-trend. Though most of its body is plastic, it's been designed with a stylish, textured faux-leather surface that feels very solid. Tap it, and you don't get that hollow sound like you do on some compact cameras. The whole camera, in fact, feels very durable. Doors, like the battery compartment, are firm and spring open. Buttons feel secure in their stations. And weighing in at 216g (without the battery) the WB350F has the reassuring solidity you'd expect from a camera, yet remains light and small enough (it measures 113.6m x 65.1 x 25mm) to carry in your coat pocket. On the camera's metal top plate you'll find (from left to right) the pop-up flash, power button, Wi-Fi button, shutter button and zoom toggle, and the mode dial. On the back, the LCD touchscreen is situated flush left, and descending down the right side is, first, the one-touch video recording button, which is situated within a grey, textured thumb grip. Below this are the familiar Menu button, four-way control pad, Playback and Function buttons. On the camera's bottom plate – also metal – you'll find a tripod mount and the battery / micro SD card compartment. On the right side of the camera is an AV port. We were a little disappointed that the camera's only memory option is micro SD, as it makes transferring your images to your computer a little more cumbersome. But overall, this is only a small niggle. The Samsung WB350F is available in white, black, blue, red or brown body options – all with the metal top and bottom plates. The Samsung WB350F starts up in a respectable 1.8secs and is ready to start taking pictures. All your options are available immediately via the touchscreen and our first impression of the camera is that the WB350F is more advanced than a traditional point-and-shoot compact camera, but just as easy to use. The camera's menu system and interface is refreshingly simple. You can access it in two ways: via the button underneath the textured thumb grip on the back, or with a press of the Menu icon on the touchscreen. You have a surprising number of options at your disposal within the Menu, such as: AutoShare, which allows you to automatically send captured photos to your smartphone as you take them; Touch AF; Face Detection; ACB, for correcting the contrast between backgrounds and your subject; Image Adjust, which allows you to adjust a photo's sharpness, contrast and saturation; and then the traditional controls like image size and quality, white balance, ISO, AF and Focus Area. Every selection and adjustment can be made via the touchscreen, which is quite handy and allows you to work quickly. You quickly realise when using the Samsung WB350F that its touchscreen is one of its main benefits. At 460k dots, it may not match some of the other touchscreens available on the market, but at this price point it demonstrates why Samsung is known as an innovator in this department: it's bright, responsive and extremely easy to use. For example, if you turn the mode dial to ASM – Aperture Priority, Shutter Priority and Manual modes – and select Manual, an icon reflecting your choice appears on the touchscreen. To switch to Aperture Priority, simply press that icon and the screen will revert back to the previous menu. The same rule applies for the Smart Mode, Photo Filter, Effect Artist and other options on the mode dial. And speaking of the mode dial, Samsung has included an impressive number of options for you to choose from. From the Wi-Fi option, for instance, you can choose to share or email images, set an automatic back-up or download apps that will turn the camera into a remote viewfinder or even a baby monitor! In the Magic Plus Mode you can select from My Magic Frame, Motion Photo, Photo Filter, Movie Filter, Effect Artist, Color Brush and the Photo Editor option, which allows you to make a surprising number of adjustments to your images. Smart Mode offers you standard scene presets like Sunset, Silhouette and Macro, but also some interesting options like Waterfall and Light Trace. Best Face on the mode dial is like a burst mode for portraits, taking several shots at once which you can then choose from. You can also edit these and apply effects in-camera. The Samsung WB350F's filters and effects are subtle, yet effective, and often striking. We really enjoyed testing these, and the whole range is worthy of regular use. Likewise, the range of scene modes produces the desired effects. However, you really need a tripod – or at the very least the self-timer – and have the camera stable on something flat when using the Waterfall mode. Overall, the Samsung WB350F produces strong, natural-looking colours when using the camera's standard colour mode – everything from skies to skin tones are reproduced accurately across a range of light conditions. However in the camera's auto mode – which most people buying this camera will use – the WB350F seems to over-expose, causing blues and greens to appear slightly cool and trend towards cyan (but not significantly so). And even then you can fix this quite easily using the in-camera editing options for saturation, contrast, brightness and colour balance. Our chief complaint with the Samsung WB350F's performance is in scenes with strong contrast. We found the camera struggles to capture significant detail in both the shadow and highlight areas. Using the camera's auto mode, the WB350F will favour the highlights, but again, overexpose. In these conditions we opted to take more manual control over the camera and underexpose by about a stop, then increase the brightness using the in-camera editing options. It was a little more cumbersome than if the camera simply had better dynamic range, but it also reinforced how useful it is to have the range of editing options incorporated into your camera. If you grow bored of the digital darkroom and only want to tweak colours and composition, or maybe add an effect, the Samsung WB350F's in-camera editing could save you from ever having to use your computer! Autofocus is very good, and never once did the Samsung WB350F struggle to lock on our intended subject. What's more, the face detection is incredibly accurate – even picking out faces in pictures hanging on the wall behind our subjects! That said, blowing images up revealed they weren't particularly sharp around the edges. But, then, you're not buying this camera to make large prints. For the Samsung WB350F's intended user, who is mostly looking to share photos online and perhaps make a few 5x7 prints, even A4, the image quality produced is perfectly acceptable. Distortion is also pretty well-contained, even in images taken at the telephoto end of the 23-483mm (equivalent) focal range. We scrutinised our photos at pixel-level, looking for examples of fringing, but we couldn't find anything egregious. Luminance noise is also kept to a minimum, although this comes at the expense of some detail, starting as low as ISO 100. As you move up the ISO scale – even at the lower end – smudging of colour becomes more pronounced. But, again, as we pointed out earlier, this won't be a problem for the purposes of the majority of this camera's users. Video quality is crisp and clear, as is the audio. However, in windy situations, such as a beach environment, wind noise dominates the audio on any movie. You can use the zoom toggle to change your composition whilst recording, but no other manual controls can be accessed. After filming, you can edit your movie in Playback mode, and then share it to social media if you wish. It is the Samsung WB350F's Wi-Fi capability that we found a joy to use. It's perhaps the fastest of any Wi-Fi-enabled camera we've tested. The WB350F had no trouble connecting to networks, whether that was in the comfort of home or reaching a lonely cafe's network on a cold, windy Dorset beach. Once connected, images share near-instantaneously to Facebook, Picasa and Dropbox. Or you can email them. We also enjoyed the Samsung WB350F's playback mode, which allows you to filter your images by date or file type, or protect certain images from ever being accidentally deleted. Best, however, is the touchscreen's swipe and pinch-and-zoom capability, which makes reviewing your images a much more intuitive experience.